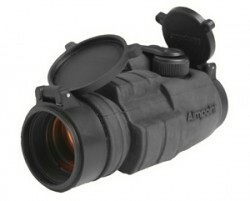 The Aimpoint CompM3 comes with a replaceable, outer black rubber cover, which protects the outside body from scratches. Featuring the new Advanced Circuit Efficiency Technology (ACET). 50,000 hours on one battery. Works with any Night Vision Device. Pop Up Caps are also provided. 500,000 hours hours of use on NVD setting and Submersible to 135 Feet of Water. Mounting Rings are available in different configurations as an option.